This is a recipe from my mom’s cookbook that originally called for ground beef and bread crumbs. I wanted to switch things up a bit and see if I could make it in a version that everyone could enjoy, regardless of dietary restrictions. 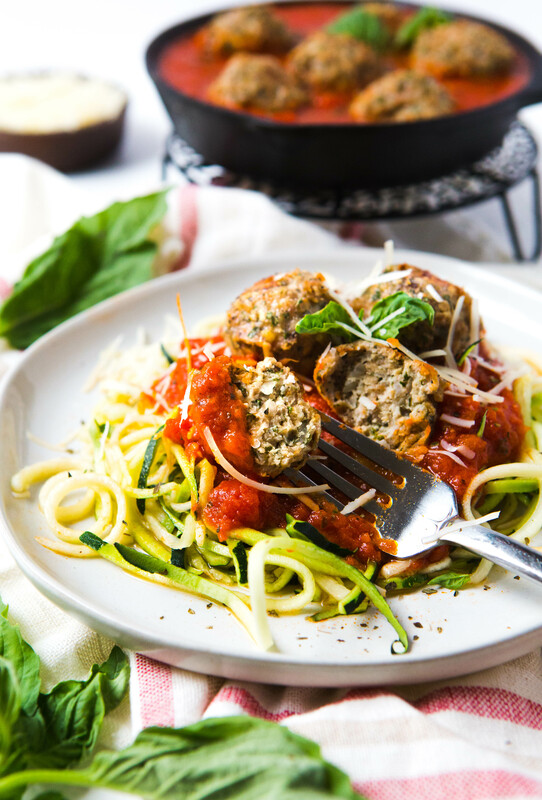 Serve these meatballs over some pre-cut zucchini noodles. Add a jar of your favorite pasta sauce and you have yourself a paleo meal! One reason I altered this recipe was because my friend Kelly was putting together a breast cancer prevention get-together to talk about the importance of what we put in and on our bodies. Kelly asked me to be a part of her event and create a grain-free meal to share with the group. We have known each other for many years aaaaaaalllllll the way back to college when we were on the dance team together (2 time National Champions – go Mavs!). Kelly is a now a wife, a mom, a nurse, and a Beautycounter consultant, among a million other amazing things! Beautycounter is a company working to get laws changed and to put safer cosmetic and body products into the hands of everyone. They want to make sure that what we put on our bodies is completely safe! As part of the movement to be cautious of what we put in and on our bodies, Kelly asked me to come and share my journey with Celiac Disease. Specifically, how to make a grain-free meal. I don’t typically eat a grain-free diet and usually do eat the gluten-free pastas and bread and snacks. So I decided try my hand at a grain-free “spaghetti and meatballs”. So easy and so good! I don’t feel overly full or bloated after eating this meal. And, most grocery stores now carry all of the ingredients in this recipe, making it even easier for YOU! You can serve these with your favorite gluten-free pasta or use pre-cut zucchini noodles like I did and make this a completely paleo meal. Just make sure your pasta sauce doesn’t have any sugar in it! I have really been loving Rao’s Homemade lately because they are made with super simple ingredients. 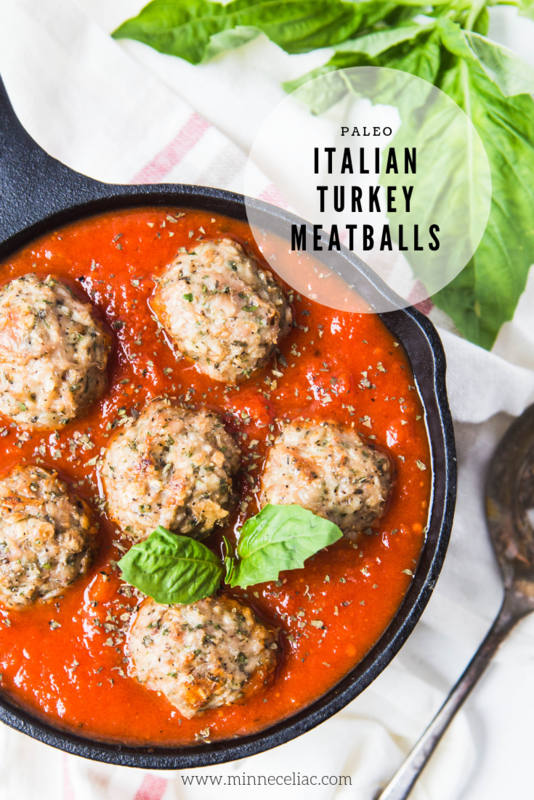 I use crushed up Simple Mills almond flour crackers crackers but almond flour or regular gluten-free bread crumbs are also great binders in these meatballs. Lots of options! My guarantee is that the recipes I share on my site are easy. Trust me, I’m not a professional chef! Honestly, you don’t even need to chop any herbs or veggies for this one. Just use dried herbs which you probably already have on hand. If you’re looking for a flavorful and filling weeknight meal that is made in one bowl, cooked in just 30 minutes, and with minimal clean-up, then this is the recipe for you! 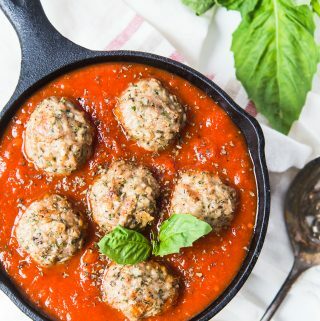 These paleo meatballs are an easy weeknight meal! Serve with your favorite gluten-free pasta, zucchini noodles, or spaghetti squash and you have a complete meal in about 45 minutes! Add all ingredients into a large bowl and mix with a wooden spatula or large spoon until well-combined. Shape into balls (I like to use a medium sized cookie scoop) and place on a parchment paper lined cookie sheet. Drizzle with a little olive oil. Bake uncovered for 15 minutes. Turn over and bake for another 15 minutes. Garnish with chopped basil and parmesan cheese. Remember that adding cheese makes these non-paleo. 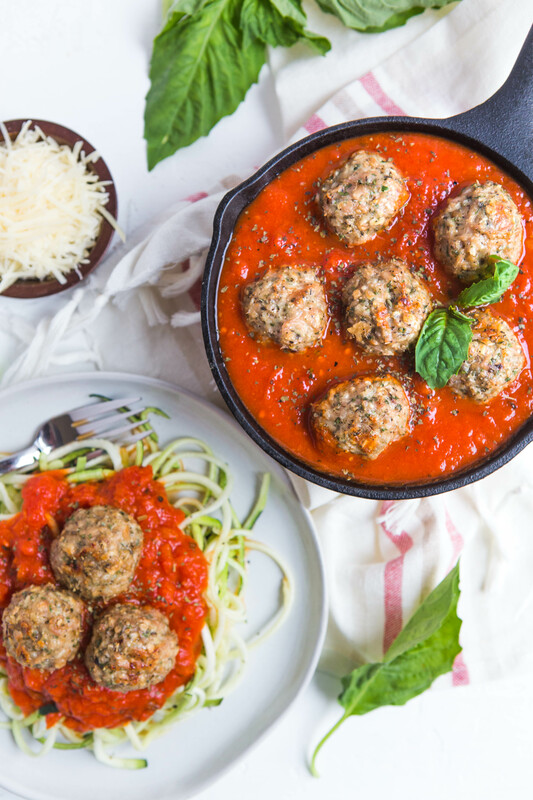 Mix these meatballs with your favorite pasta sauce and served over either gluten-free pasta or zucchini noodles or spaghetti squash. You can buy pre-cut zucchini noodles at the store. If using zucchini noodles, sauté them for 2-3 minutes until al dente. To crush up the crackers, add them into a ziplock baggie and pound them with your measuring cup! You can pin this recipe by clicking on the photo below.